The world loves grumpy cats (just ask Grumpy Cat herself). We tend to think of our feline friends as sassy, independent, and apathetic creatures—and for many cat lovers, that low-key attitude is all just a part of their charm. But are our cats really unhappy? Here are six ways you’ll know if your cat is living his best life (even if he’ll never admit it). Where your cat does his business can tell you a lot about his health—and his happiness. If your cat has made a habit of missing the litter box, or eliminating somewhere else entirely, a medical problem or stress may be to blame. Choose an appropriate box. Make sure your cat has plenty of room to move around and can get in and out of the litter box easily. Give him the pick of the litter. Experiment by offering a choice of litters in side-by-side boxes to see which type your cat prefers. Keep it clean. No one likes a dirty bathroom—be sure to scoop your cat’s litter box twice a day and change litter weekly. Consider your cat’s perspective. Often, litter boxes are located in places that are convenient for humans—and unknowingly cause stress for cats (think a laundry room with a loud washer or dryer). Instead, your cat’s box should be placed in a quiet, low-traffic area. Follow the one for one (plus one) rule. When it comes to litter boxes, there should always be one for each cat, plus one—in different locations, of course. A clean cat is a happy cat. If your cat is not grooming as much as he used to, he could be overweight, painful, or just not feeling like himself—all of which warrant a visit to the veterinarian. On the other hand, overdoing it can also indicate a medical or behavioral problem, like anxiety. If you notice compulsive grooming behaviors, such as excessive licking or biting or a thinning haircoat, talk to your veterinarian. We tend to think cats have it pretty easy (Sleeping all day? Yes, please! ), but the truth is, they can and do experience stress. Environmental enrichment, particularly for indoor cats, can increase physical activity and mental stimulation, keeping behavioral issues at bay. If your cat is living in an environment of plenty—that is, plenty of room, toys, perches, windows, sleeping areas, food, water, litter boxes, and human interaction—chances are, he’s pleased. From the tops of his ears (forward and alert or pinned back against his head?) to the tip of his tail (straight up and swaying or rapidly swooshing from side to side? 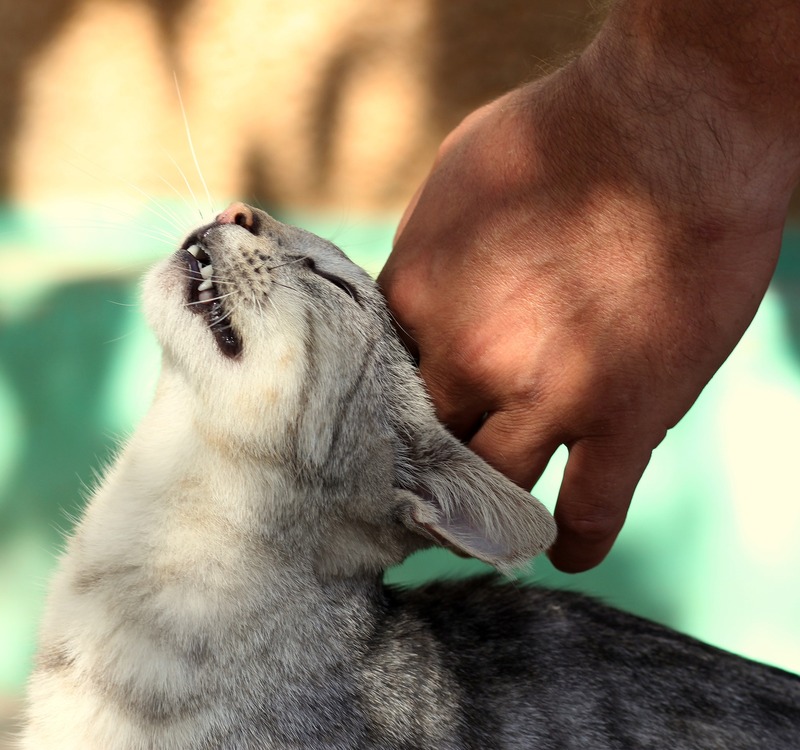 ), your cat’s body language speaks volumes about how he’s feeling. Is he kneading, head-butting, or purring? Congratulations—you’ve got yourself a contented cat. What is most important for your cat’s happiness? It depends. Every cat is different, but like humans, they’re all creatures of habit. If your cat is regularly engaging in the activities he enjoys most—whether it’s snuggling his favorite human or some of his lesser desired traits, like jumping onto the kitchen counter—he’s likely got no complaints. Have you noticed your cat isn’t doing what he used to? Talk to your veterinarian. She can help you uncover any underlying medical issues and develop a treatment plan to get him back to his old habits. Cats are masters of disguise, which unfortunately means signs of medical and behavioral issues can easily go unnoticed. Regular exams allow your veterinarian to pick up on subtle clues about your cat’s health that, if detected and treated early, can greatly improve his physical, mental, and emotional wellbeing. Ready to keep your cat happy—and healthy—for many years to come? Schedule an appointment!